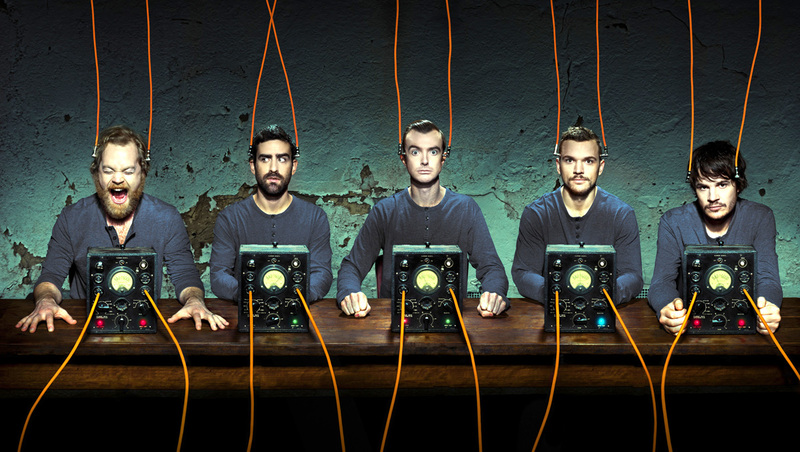 PLUGGED IN: Karnivool, featuring guitarist Drew Goddard (second from left), make another powerful statement on Asymmetry. Karnivool does nothing on a small scale. The Perth progressive rock group’s monstrous third record, Asymmetry, took 12 weeks to make. It debuted at number one on the Australian album charts and won the Aussie group an ARIA for Best Hard Rock Album. In between was a five-and-a-half week tour of Europe. “The shows were amazing – there was real [fan] growth everywhere,” guitarist and co-songwriter Drew Goddard says. Karnivool’s tour started in Amsterdam and worked its way through France, Belgium, Italy, Switzerland, Germany and finished in England and Scotland. “It was about the fifth time we’ve been [to Europe] and they were really cracking shows,” he adds. Given their global popularity both here and abroad – they played to more than 1500 ­people in Cologne – Goddard admits that the band members were confident Asymmetry had the chops to nail a number one chart position. Karnivool are touring with fellow prog-rock purveyors Dead Letter Circus and post-­rockers Sleepmakeswaves. It won’t be the first time these acts have toured together. Karnivool took Dead Letter Circus on the road as their main tour support when they heard the emerging group’s first EP in 2008. The two bands have remained friends. Sleepmakeswaves have also toured with Karnivool. For Karnivool’s Hunter fans their show at Newcastle Panthers on Thursday will be the first chance to hear the large ambitious tracks from Asymmetry live. The album was recorded between Byron Bay’s 301 and the band’s own recording ­studio and was engineered by former Oakhampton resident Jordan Power. The album is intricate in detail and the songs are dynamic and thunderous. The members of Karnivool, who share their lead singer Ian Kenny with rock band Birds of Tokyo, don’t have clearly defined songwriting process – they just follow their instincts. Because Kenny divides his time between two successful bands – he was Australia’s first lead singer to have a number one record with two different acts in the same year – Karnivool often write the beds of the tracks without their vocalist. Given the layers and atmosphere of Karnivool’s music, and the long recording process, it can be difficult for the group to know when a song is complete.